Dalton Trumbo is no doubt an interesting figure and a perfect case of someone whom it would be worthwhile to make a Hollywood biopic about. Maybe it's simply that director Jay Roach, who has mostly worked in broad comedy while mixing in politics lately with the likes of Game Change and The Campaign, doesn't know what else to do as a director, but his latest effort that profiles the rogue screenwriter feels all too complacent to accurately depict the radical and rebel ways of Mr. Trumbo. In short, this is a by the numbers biopic that tells us what happened, why it happened, and how the titular character lived out the rest of his days with the obligatory pre-credit note cards. That isn't to say the history isn't interesting or that there aren't good or intriguing moments throughout, but more that Roach does nothing with these moments to make them feel as vital or illuminating as they likely were for these people in the context of their actual lives. More than that, the biggest downfall of the film for me personally is that of the same mistake many biopics about musicians make in that they never explore what makes the artist want or need to create. 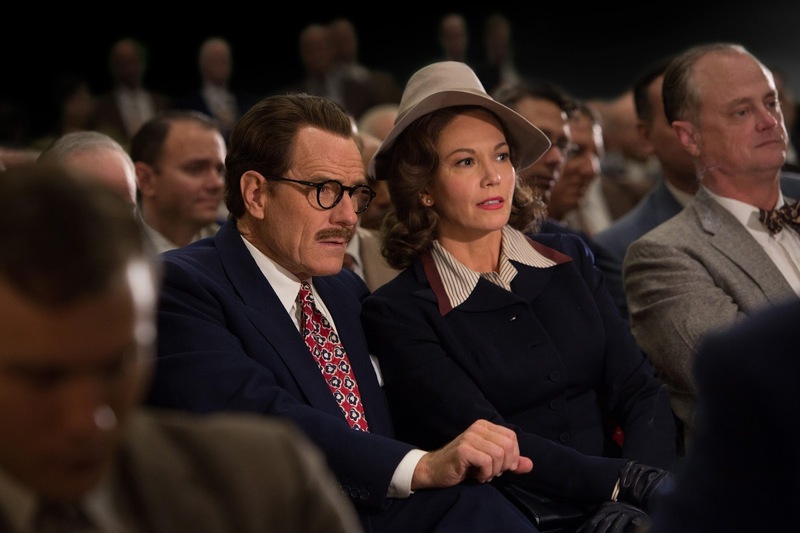 To this effect, Trumbo never delves into its protagonist's writing process. 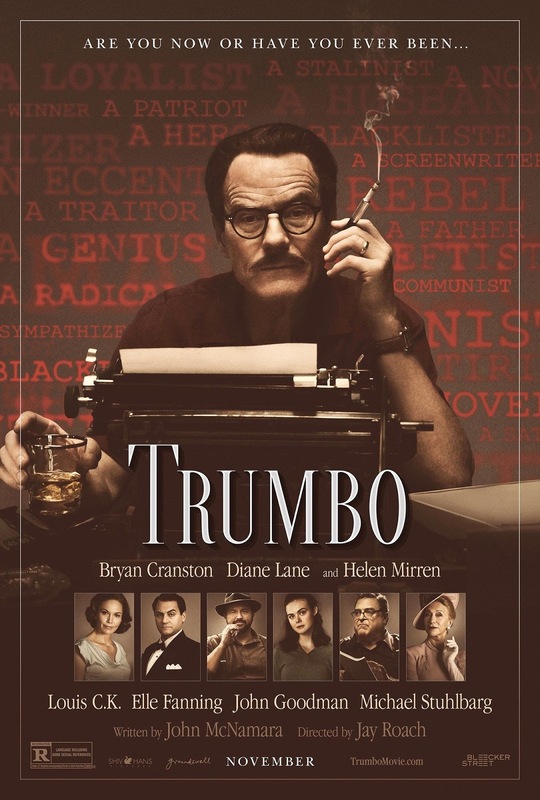 Now, I understand that this film is not exclusively about the life of Dalton Trumbo, but more specifically the decade long fight he put up that saw him blacklisted and sent to prison due to his political beliefs. Still, this man was largely known as the biggest and best screenwriter working at the time his political entanglements began and is a large factor in how he fought back-managing to win two Academy awards in a time when everyone in the industry shunned him. Writing was not just a part of who this man was, it was who he was and to essentially skim over this opportunity to explain not just that he was a good and prolific writer, but how he came to be this way and how he remained inspired is one that is missed in exchange for little more than hitting the cliff notes of who this man was and how he dealt with the biggest trial of his life. Trumbo is by no means a bad movie; it has a number of good to great performances and due simply to the nature of the story it is endlessly fascinating, but this particular representation is little more than average given all it had to work with. Dalton Trumbo (Bryan Cranston) and his wife Cleo (Diane Lane) attend the premiere of a film Dalton wrote. 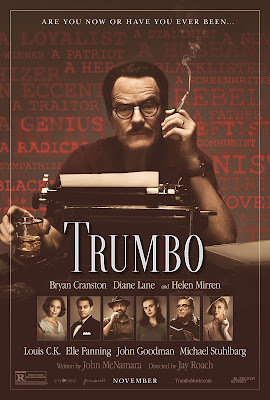 Beginning in 1947 and introducing us to the fact that Trumbo (Bryan Cranston), while owning the title of communist given to him, was more fighting for the belief that he should be able to think the way he wanted without being reprimanded for doing so than anything else. For publicly coming out with this opinion though, he along with several other screenwriters and actors were forced to testify to Congress regarding alleged Communist propaganda in their widely received Hollywood films. Of course, when they testified in their own particular way it only pushed more buttons forcing Trumbo to serve an eleven month stint in a federal prison in Kentucky. That this man went to prison for essentially thinking a certain way stirs something in those around him-including fellow screenwriters Arlen Hird (Louis C.K.) and Ian McLellan Hunter (Alan Tudyk) while other lifelong friends, such as Edward G. Robinson (Michael Stuhlbarg) and producer Buddy Ross (Roger Bart), turn tail and run as fast as they can in hopes of keeping their careers as afloat as possible in the aftermath of Trumbo's actions. After being released from prison and moving into a smaller house with his wife, Cleo (Diane Lane), and their three children (which includes the likes of Elle Fanning at a certain age) the writer begins working under different pseudonym's for King Brothers productions (led by a boisterous John Goodman) churning out script after script of pure schlock for a less than lousy pay day. 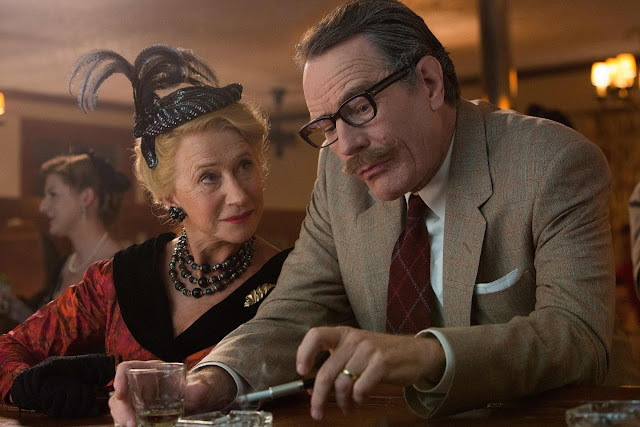 While consistently receiving push back from the likes of gossip columnist Hedda Hopper (Helen Mirren) and "The Duke" himself John Wayne (David James Elliot) it comes down to a small group of influential people in Hollywood that take notice of Trumbo's superior skill, no matter his political leaning, and grant him a second chance at recognition (or at least something other than notoriety) given he'd already won two Oscars, but was never able to accept the statues due to the fact it wasn't his name on the scripts. Beyond everything that makes Trumbo feel stagnant though, there is the question of the rather exceptional cast and it is in their hands that much of the film is saved. As our protagonist, Bryan Cranston is more than capable and he handles every line of perfectly crafted dialogue, every scene of the writer picking away at his scripts in his bathtub, and every encounter with vastly different individuals with the utmost credibility. Playing the man over the course of more than a decade Cranston is required to not just transform physically, but to show a man slowly deteriorating by the toll standing up for what he believes in is taking on him. We see his addiction to Benzedrine increase as he searches for ways to remain motivated while writing, editing, and re-writing his own as well as others countless crap scripts for low pay in order to keep his family afloat. As much as Cranston is able to play this workaholic who simultaneously spearheaded the communist movement against the American Film Association with a strong balance of sternness and comic relief this is another issue the film as a whole faces. There are moments when the film needs to be deathly serious for the audience to understand the stakes and risks involved in the scenarios our characters are willingly placing themselves in, but there is a consistent undertone of light, breezy comedy that undermines the heaviness that is fighting for it's space on the shelf. Were it not for Cranton's ability to maneuver from a wholly likable personality to an intimidating one in the blink of an eye there is no doubt the film wouldn't work as well as it does. In other key roles, Louis C.K. is nothing short of fantastic and the same can be said for Goodman and the always reliable, always fantastic Stuhlbarg. Unfortunately, Mirren isn't given much to do despite her character being outrageously flashy while the likes of Adewale Akinnuoye-Agbaje and Christian Berkel show up for only a few scenes, but are memorable even in their short time. It is in it's performers that Trumbo finds life and in their interpretations of their characters that we don't simply remain complacent, but are able to reach peaks the script and crew alone could not have been able to ascend. whether or not he was the one actually behind Roman Holiday. It's difficult to pinpoint exactly what is so nagging about Roach's film given it seemingly does everything it's supposed to and even finds something of a groove early on, and yet it simply didn't hit the necessary sweet spot I felt it needed to. More than anything, there was a desire for the film to be more insightful into the industry considering the type of person who would seemingly enjoy a movie about Dalton Trumbo would be someone who finds film history fascinating. Maybe this type of person would be more impressed with the film than me, but given I consider myself a fan if not an aficionado of film history I feel as if I should demand more from the film rather than to simply accept the delivery of facts I could read on a wikipedia page as presented by gifted actors. I hate to harp on Roach, but for a movie about movie makers and the passion for creating film the directing here also feels rather stilted. The production in and of itself, while made for a cool $15 million, looks as if it were a made for TV movie that exists within the clean and sheen world that we stereotypically think the entire decade of the fifties looked like. That screenwriter John McNamara (Aquarius) decided to focus on the broad scope of Trumbo's blacklisting rather than zeroing in on a specific angle doesn't aid in the feeling the film merely skims the surface of just how devastating and life-altering what not only the titular character experienced, but his family and friends as well. Were McNamara to take a more deep-seated investment in say, Trumbo's involvement in the making of Spartacus, he could have delved deeper into the trenches about how much of a limb Kirk Douglas (a spot-on Dean O'Gorman) must have had to go out on to ask for Trumbo's help or the no doubt intense conversations and dynamics between Douglas and many a studio heads to get them to release the film with Trumbo's name on it. Such a perspective would seemingly illustrate the larger scope of Trumbo's situation by zeroing in on a prime example thus giving more weight and drama to the presented situations while at the same time essentially teaching the same history we learn here.